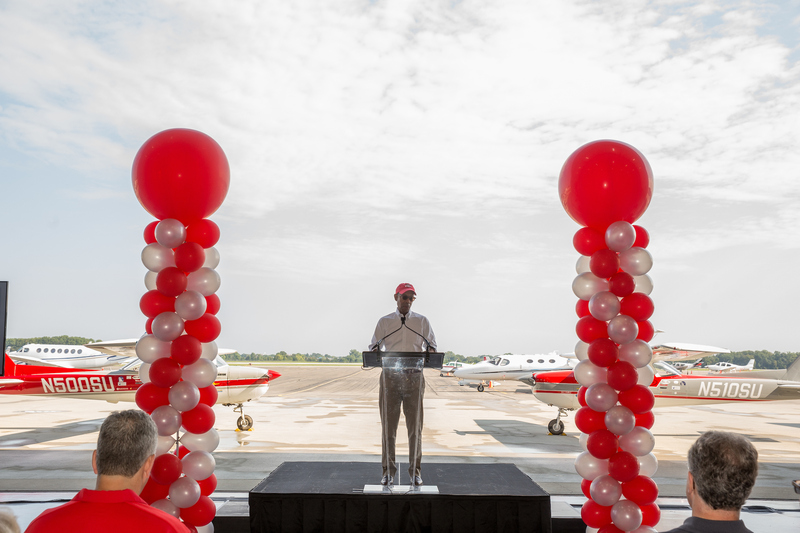 Enhancements to The Ohio State University Airport at Don Scott Field will elevate the aging facility to keep it at the forefront of aviation innovation and education. 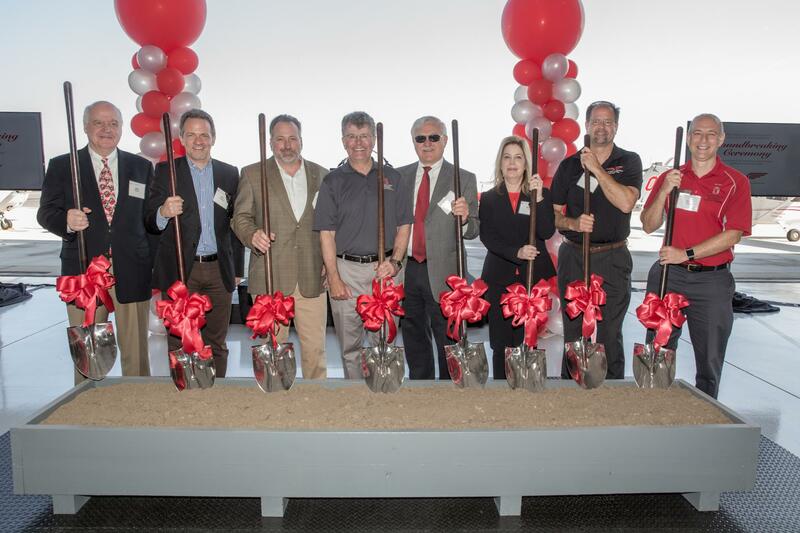 Members of the Austin E. Knowlton Foundation and university leaders broke ceremonial ground at the airport on August 19. Pictured (from left): Bob Pitcairn, Eric Lindberg, John Lindberg, Engineering Dean David B. Williams, Ed Diller, Sherri Calk, Airport Director Doug Hammon and Center for Aviation Studies Director Seth Young.On National Aviation Day, August 19, university leaders broke ceremonial ground for the Austin E. Knowlton Executive Terminal and Aviation Education Center. The $20 million project will support construction of a new aviation education and research facility with state-of-the-art flight simulators, research labs and classrooms. Combined with a modern flight terminal, the new facilities will integrate the business of aviation with the educational and research mission of the university. Also part of the overall effort, new hangars were completed in June. Half of the funding comes from the Austin E. Knowlton Foundation, which provides grants to advance higher education. Evolving with industry and community needs is essential for the airport, as much of its infrastructure has remained unchanged for more than 50 years. Since opening in 1942, Ohio State’s airport has served as a learning lab for future aviation professionals, a hub of research and a highly regarded facility for civilian and small business aircraft. Ohio State President Michael V. Drake address the crowd at the groundbreaking ceremony for the Austin E. Knowlton Executive Terminal and Aviation Education Center.“We’re a land grant university, that’s at the heart of our existence, the heart of our mission,” said Ohio State President Michael V. Drake. “And that means that we’re here for the people of the region and the state to be able to train people — to be able to do things that uplift the quality of life of people in our community — and this is a perfect example of that,” Drake said. The modernization of the airport is described as “distinctly 21st century Ohio State” and leadership expects the new facility to become a point of pride for the university as well as the local community in northwest Columbus. The new facility is expected to open in January 2019.